Title: : The Countie of Nottingham, described. The Shire townes and situation and the Earls there of observed. Description: Nottinghamshire. A decorative map from the second edition of Speed's seminal atlas, 'The Theatre of Great Britaine'. Showing a vignette of Nottingham. 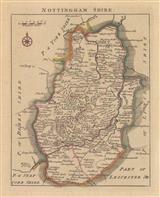 Description: County map of Nottinghamshire. Engraved for Camden's Brittania from Saxton's survey. Coloured. Description: Grand Dutch Golden Age map of Nottinghamshire with rich original hand colour. Dutch text on verso. Description: This early map of Notthinghamshire is based on the surveys of Speed and Saxton. The elaborate dedication is to Philip Stanhope, 2dn Earl Chesterfield, a notorious ladies man in the during the reign of Charles II. 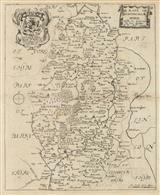 Description: Early miniature map of Nottinghamshire. Coloured. 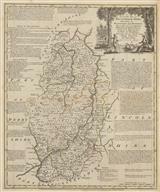 Description: Fine copper-engraved map of Nottinghamshire with decorative cartouche. Coloured. Description: County map of Nottinghamshire based on Blaeu but issued by Valk and Schenk with armorial shields and the arms of Great Britain. Coloured. Description: Nottinghamshire. County map with decorative borders illustrating local antiquities. Original colour. Description: Nottinghamshire. Bright, decorative county map, with elaborate cartouche and Coats of Arms. Inset town plan of Nottingham. Coloured. 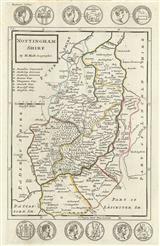 Description: County map. Vignette and text. Original colour. Description: County map of Nottinghamshire with the roads, both completed and under construction, marked. Coloured. Description: A rich and detailed map of Nottinghamshire taken from Bowen’s landmark survey of Georgian England. Original colour. 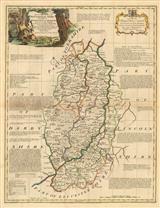 Description: Elegant county map surrounded by panels of text describing the cities and industries. Original hand-colour. Description: Splendid large map of Nottinghamshire showing Turnpike roads, parks and "Gentlemen's Houses". Original hand colour.